Social security scheme: 625 employer companies enlisted in Fund - Integration Through Media ....! Ashok Ghimire, KATHMANDU: Enthusiastic participation of employers in social security scheme based on contribution has been taking place. 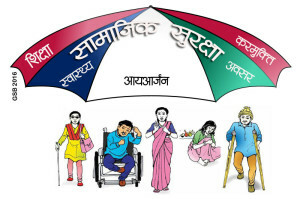 Some 625 employer companies of province no 3 including Kathmandu valley have already been enlisted in social security fund till Sunday. The Ministry of Labour, Employment and Social Security on November 12, 2018, had urged the employer companies and labour suppliers of Kathmandu valley to be enlisted in the fund from November 22, 2018 to February 18, 2019 by publishing a notice in the Nepal Gazette. The Fund has provided separate enlisting number to every employer company. Executive Director of the Fund, Shyam Raj Adhikari, said that the enlisted companies now have to register the name of their workers and employees. Separate social security number would be provided to the workers and employees registered in the Fund and the amount would be deposited under such numbers of the workers and employees. At a programme organised by the Fund here on Monday, Minister for Labour, Employment and Social Security, Gokarna Bista, distributed certificates to the employer companies enlisted in the fund. Saying the social security scheme was brought as tripartite agreement between workers, employers and government, Minister Bista urged the industrialists and entrepreneurs to make it successful. “This is a common programme of government, employers and workers. This programme will play a significant role in making the labour sector systematic, disciplined and safe”, he said. Minister Bista also expressed the belief that the entrepreneurs, yet to be enlisted in the fund, would come in enlisting process immediately. The government has asked all employer companies to be enlisted in the fund by coming May.